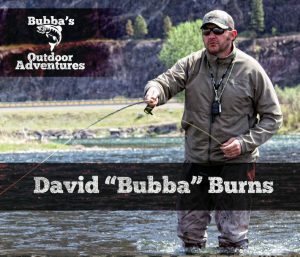 David “Bubba” Burns is a native Montanan who received the nickname in the second grade and it stuck. His love for fishing and enjoying the outdoors started at a young age while camping with his family around the state. Growing up, he spent all of his free time fishing the Yellowstone, Stillwater, Boulder and Bighorn rivers, all of which were within a day’s drive of his hometown of Laurel, Montana. Bubba’s professional fly fishing guide career started in 2003, while living in Dillon, MT. He loved the fact that he could make a living by enjoying the beauty of Montana’s scenery and sharing his passion for fishing while meeting new people from all over the country. During the Montana winter months of 2004-2008, Bubba had the opportunity of broadening his guide experience by working in South America. He guided for a 5 star lodge near Coyhaique, Chile, in the heart of the Patagonia. This was truly a life-changing experience for Bubba. More recently, he spent the fishing off-season hunting and guiding Big Game for Hidden Valley Outfitters. After thirteen years of being in the guide business, Bubba is well-known for being a knowledgeable and reputable outfitter / guide. He takes pride in working hard for his clients to make sure they have a trip of a lifetime. When asked what my favorite river to fish is, Bubba’s answer is “whichever I am on at the time.” (It’s hard living in Montana and have a favorite river to fish). In 2015, Bubba made the jump from being a guide to starting his own business as an Outfitter. This gives him the opportunity to better connect with clients and make sure they have an extraordinary Montana Adventure. The goal of Bubba’s Outdoor Adventures is to determine what the client’s idea of a trip or vacation of a lifetime is and then make every effort to fill in the details to accomplish that. Anything less than that, is unacceptable, in his eyes! Book now for your next Montana Adventure!